Affirmative action in college admissions has never been more imperiled than it is today. With the nomination of Judge Brett Kavanaugh to the U.S. Supreme Court, today’s fragile 5-4 majority in favor of affirmative action could quickly shift to become a conservative majority against race-conscious admissions practices. Meanwhile, the Trump administration is rolling back Obama-era guidelines that support the practice of race-conscious admissions. A high-profile federal lawsuit alleging that Harvard discriminates against Asian Americans could eventually give a conservative Supreme Court the opportunity to strike down affirmative action. Spearheaded by anti-affirmative action legal strategist Edward Blum, the lawsuit—brought by a group called Students for Fair Admissions—claims that Harvard illegally discriminates against Asian American applicants by limiting their admissions numbers each year. Harvard, however, denies the allegations. By advancing a false narrative that affirmative action is damaging to Asian American college applicants, this headline-grabbing case is undermining efforts to promote access to higher education for marginalized students. Asian Americans and Pacific Islanders are often studied and grouped together under the umbrella terms Asian American and Pacific Islander (AAPI) or Asian American, Native Hawaiian, and Pacific Islander (AANHPI). For the purposes of this column, however, the author focuses on only Asian Americans, where possible, to acknowledge that Native Hawaiians and Pacific Islanders (NHPIs) have their own unique needs that differ from those of the Asian American community. Some of the data presented are from organizations that study both Asian Americans and Pacific Islanders, such as AAPI Data—a project based at the University of California, Riverside, that shares data about Asian Americans and Pacific Islanders—and the National Commission on Asian American and Pacific Islander Research in Education (CARE). The author chose to focus on data on Asian Americans and to use an aggregate AAPI number as needed as a point of comparison to highlight the importance of disaggregating data. Thorough disaggregation of data on Asian Americans, Native Hawaiians, and Pacific Islanders is still necessary. Without robust disaggregated data, particularly for NHPIs, policymakers do these communities a disservice by failing to adequately address their unique needs and concerns.Although this column focuses primarily on the Asian American community and its subgroups, the author does briefly touch upon American communities who are Latinx and black. In those instances, the author uses “Latinx” and “black” in general cases. If the text is tied to an underlying source, the author defers to the source language, resulting in some inconsistencies. Race-conscious admissions policies have been and are still necessary for all students of color, including Asian Americans, to combat long-ingrained inequities in higher education. Regardless of how the legal battle over affirmative action unfolds, institutions must be held accountable to ensure equitable access for all students of color. The plaintiffs in the Harvard case invoke the “model minority myth,” which portrays all Asian Americans as highly successful, both academically and professionally, to advance and support their argument that Asian American students are hurt by race-conscious admissions. They argue that Asian Americans have stronger overall academic performances but are being rejected to maintain what they call “racial balancing”—artificially capping the number of Asian American students admitted, while admitting less qualified white, black and Latinx applicants. However, presenting the Asian American community as one homogenous group harms all Asian Americans—especially those who do not fit the model minority stereotype. High national attainment rates for Asian Americans as a single collective obscure very low college graduation rates and inequitable college access among certain Asian American ethnic subgroups. A 2014 report from the Center for American Progress and AAPI Data, for example, found that about half of Asian Americans hold a bachelor’s degree or higher. However, only 27 percent of Vietnamese Americans and 17 percent of Hmong and Cambodian Americans hold at least a bachelor’s degree. These discrepancies are nothing new. A 2004 study found that Filipino Americans and Southeast Asian Americans represented only 19 percent and about 25 percent, respectively, of Asian Americans enrolled at highly selective institutions. ** Chinese Americans and Korean Americans, on the other hand, enrolled at higher rates of 35 percent and 38 percent, respectively. Contrary to the model minority myth, many Asian Americans stand to benefit from affirmative action. Asian American communities face factors that play into low college attainment, including poverty and a lack of access to high-quality K-12 education. According to the 2016 Post-Election National Asian American Survey, 57 percent of Cambodian Americans and 53 percent of Hmong Americans say that there is a “very serious” problem with the quality of their children’s schools. And because of shifting U.S. immigration patterns and policies, the income gaps among Asian American ethnic communities are the largest among all racial groups. Southeast Asian Americans, for example, experience poverty at rates higher than the 11 percent national average for all Americans. These disparities highlight the necessity of affirmative action and race-conscious admission practices for all students of color. 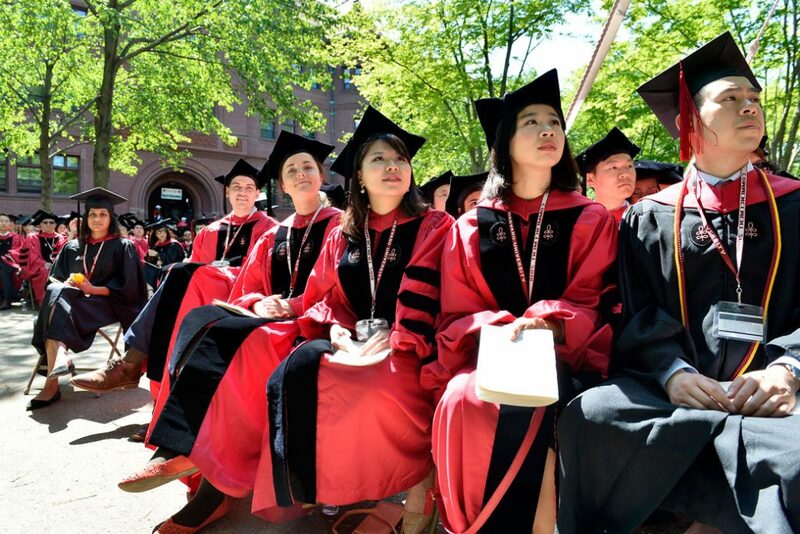 While some commentary about the Harvard case has given the impression that Asian Americans are against affirmative action, in actuality, the majority of the Asian American community supports race-conscious admission policies. According to an AAPI Data survey, almost two-thirds of Asian American respondents support affirmative action, and many Asian American organizations have banded together to affirm their support for race-conscious admissions policies in light of the Harvard case. The AAPI Data survey also shows that opposition to affirmative action is highest among Chinese American respondents in comparison to other subgroups. While a definite cause of this trend is not yet known, misinformation spread via certain social media platforms popular with first-generation Chinese immigrants in America may contribute. The Asian American community encompasses diverse experiences and needs that the group suing Harvard conveniently ignores. Lumping all Asian Americans together does not provide an accurate, nuanced picture of the entire group. As stressed above, race-conscious college admissions policies have been key to increasing the presence of students of color on campus. While disaggregated data for the Asian American community are still needed, more readily available statistics for other students of color reveal how higher education remains inaccessible for some groups, particularly low-income and black and Latinx students, because of structural barriers stemming from systemic disenfranchisement. Often, these students of color have less familial wealth compared with their white peers and attend underresourced K-12 schools in segregated neighborhoods. And the rising cost of college and student loan debt in higher education can exacerbate existing inequities. These disparities act as barriers to accessing higher education and exist at the institutional level. At top, highly selective universities, black and Hispanic students are underrepresented, even when compared with their white peers of a similar socio-economic status. It is equally important to note that black and Latino students are overrepresented at certain institutions, such as community colleges, that have fewer resources and less funding to support these students and help them succeed. Major inequities clearly exist in higher education institutions and the college admissions process, but the Harvard plaintiffs are bringing attention to the wrong issues. White and wealthier applicants have a leg up in current admissions processes in myriad ways, including test scores, resources, and cultural capital, as well as institutions’ preference for legacies, children of faculty, and recruited athletes. For example, records released as part of the case show that 22 percent of white students at Harvard were legacy admissions; the total admission rate for legacies at the university is 34 percent. Comparatively, Harvard’s overall admission rate for nonlegacies is 6 percent. Court documents also show that recruited athletes and children of faculty were admitted at rates of 86 percent and 47 percent, respectively. As seen in Harvard’s own admissions practices, institutions’ preferences for legacies, faculty children, and recruited athletes disadvantage all low-income students and students of color. Affirmative action is a necessary first step—one among other much-needed reforms—to ensure equity and diversity in all higher education institutions. No matter what happens with the Harvard case or at the Supreme Court, higher education institutions must work to ensure that all students of color have an equitable chance at attending top universities by re-evaluating their current admissions preferences and procedures. This includes collecting disaggregated data on Asian American students and other students of color to better address any differences in access and recruitment among ethnic subgroups. However, colleges need to do more than simply admit a diverse student body. An amicus brief filed by numerous Harvard student and alumni organizations of color notes that diversity alone does not create a safe and inclusive environment in which marginalized students can thrive. Multiple incidents of racist hostility and harassment toward students of color on Harvard’s campus show that the institution has yet to achieve full inclusion. Providing continued support to and resources for students of color on college campuses—such as funding ethnic studies programs and cultural organizations, as well as inclusion training for faculty and administration members—is imperative to these communities’ success. Institutions still have ample opportunity to get equity and diversity right. Sylvia Guan is an intern on the Postsecondary Education team at the Center for American Progress. * The National Commission on Asian American and Pacific Islander Research in Education’s study acknowledges that the AAPI category consists of the two distinct groups: Asian Americans and Pacific Islanders. The AAPI mean admission rate is used in this column only as a means of comparison. ** The 2004 study uses “Asian Pacific American” and “Asian American” interchangeably. The findings are pulled from the 1997 Freshman Survey from the American Council on Education and UCLA, which does not include an NHPI category.